CARLSBAD, Calif. (June 23, 2018) -- If there was a theme song for Bobby Bucey's weekend run to the California Amateur Championship title, it would surely be "Won't Back Down" by Tom Petty. Faced with a 4-down deficit in Friday's quarterfinal match against Noah Woolsey, Bucey rallied back to stay alive in the bracket. He lost three holes in a row with bogeys, but reached in deep, and found something. After birdies on Nos. 6 and 7, Bucey didn't record a single bogey, and flipped his opponent, winning 3&2. Today, against Hidetoshi Yoshihara, things looked even bleaker. Yoshihara, a sophomore at UCLA, turned on the heat late in the first 18 holes, making birdies on three of the last four holes 3-up. His medal play score (with the usual concessions) was 67. On the second hole of afternoon play, Bucey had to re-hit his bunker shot after his first effort hit Yoshihara's bag. Yoshihara took the hole, and a 4-up lead, to the next tee. But just like Friday's semifinal against Woolsey, Bucey birdied back-to-back again at Nos. 6 and 7, the latter hole playing 465-yards with a back-left hole location. Bucey played his approach to the center of the green, and holed a 20-footer. He narrowed the lead to just one hole with a par on No. 9, when Yoshihara's drive just failed to clear the water on the right side of the tough dogleg-right par-4. A deft up-and-down chip on No. 10 brought Bucey back to square with Yoshihara, with the advantage of momentum on his side. That's where the 29-year-old former baseball player -- he went with golf when forced to make a choice in high school -- started to look like a man on a mission. His mom Karen called him a scrappy baseball player, and the kind of tenacity that he learned playing shortstop helped him avoid dropping holes at key moments on the back nine. First there was an up-and-down from tight lie on No. 12, a long par-3 where Yoshihara was sitting pretty on the green with his driving iron tee shot. After almost holing his pitch, Bucey converted a 5-footer and the small crowed saw a little fist pump. "I practice those chips all the time," said Bucey, who works doing audits for an accounting firm. After being saved by a tree from going o.b. with his second on the 519-yard par-4 14th hole, Bucey could only watch as Yoshihara nearly chipped in for birdie, and lost the hole (and a bit of his momentum) when he failed to save par from the thick Kikuyu. This was looking like one of the best finishes in the tournament's history, yet there were just a handful of friends and family looking on. Not to worry, Bucey and Yoshihara knew the magnitude of the situation. On No. 17, Bucey stuffed his approach to 6-feet on the par-4, while Yoshihara left himself with a treacherous 30-footer for birdie over a hump in the deep green. His first putt left him an unsettling 5-footer, but when Bucey failed to convert he had a chance. As Yoshihara's par save slid by, he was left to wonder if his runner-up finish in 2016 was about to be repeated. But Yoshihara didn't back down either. Both players hit perfect drives on the par-5 18th, finding the fairway, and close proximity to each other at less than 20-feet away. Their layup shots were even closer, and they were left to determine whose turn it was by using a laser. "I've never seen that happen," said the 3-time NCGA title winner Bucey. Yoshihara had the honor, and he hit a solid approach to 20 feet. Bucey followed, and once again the players were within close range, a couple of feet away. Bucey's putt to clinch the title slide by the right side, and despite getting a perfect read Yoshihara's putt to send it to extra holes did the same thing. Bucey's father was on the bag all day (and all tournament) while Yoshihara carried his own. It was a lonely walk to the clubhouse and awards ceremony, but try and try again Mr. Yoshihara. You're just 19, and the third time is the charm. And next year's championship is at a nice venue, Monterey Peninsula Country Club. To the Southern California Golf Association for partnering with AmateurGolf.com on written, photo, and video coverage this week. 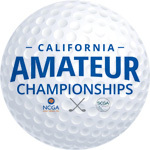 The Championship is open to amateur golfers who have established current indexes of 4.4 and are members in good standing of the Southern California Golf Association, the Northern California Golf Association, or the Public Links Golf Association of Southern California. Nonexempt players must qualify. An entrant may play in only one qualifying event, even if the golfer belongs to clubs in both Southern California and Northern California. The 18-hole qualifying rounds will determine the qualifiers. The championship field will play 36 holes of qualifying at a Northern or Southern California Location, with the low 32 golfers from that combined field moving on to match play (with a playoff, if necessary, to determine the final spots). Two rounds each of 18-hole match play will follow on Thursday and Friday and the 36-hole final match will be on Saturday. The location will rotate yearly between Northern and Southern California locations.